A little peace of mind while you take your newborn and/or toddler out in the sun. 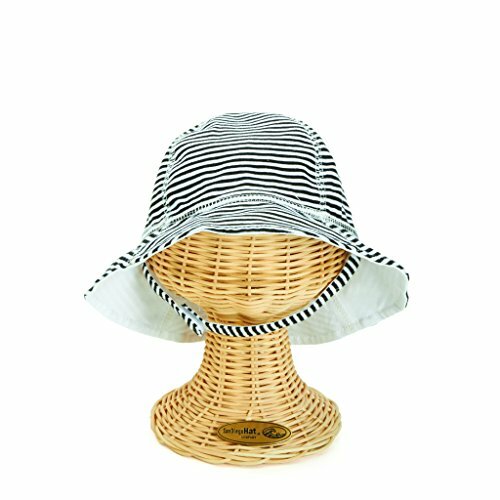 The Striped Sun Hat stays on their head while keeping the sun out. Soft, flexible material is comfortable to wear and the hook-and-loop chin strap keeps the hat securely in place. And while we do a great job of protecting their little heads, please remember to apply ample sunscreen to the face, ears, and the rest of the body. We never stop designing. Inspired by hats the world over, The San Diego Hat Company has quickly grown into the place to go for new styles and new colors, while keeping a focus on comfort and quality. While sun protection is a great reason for wearing a hat, we believe the hat should also fit well and look good with any outfit. Adjustable sizes in several designs, or multiple available sizes in others, along with fashionable colors make for a great accessory to wear any time. SECURE FIT - Hook and Loop chin strap keeps the hat in place. Perfect for your active little ones.